So you have started your favourite Office 2007 program for the first time. And now you are lost. What happened to the file menu? Where is the help menu? What on earth is that circle in the top left corner? Lets quickly run through a Microsoft Office 2007 user interface tutorial so you can get up to speed and productive in no time! What happened to the file menu? The old style menu system from Office 2003, mycoplasmosis Office XP, viagra and earlier versions has been replaced with a brand new interface, which most people call the ‘Ribbon’. Why did Microsoft replace the old style menu with the new Ribbon? Because it was getting to difficult to find the right menu options because the menus were too complicated. The Ribbon is designed to make it easier to find the features that you need to use. The Office Orb = The old file menu. As you can see in the picture, the orb is a circle with the Office logo in it, which is located in the top left hand corner of the application. The Office Orb contains the same style tasks that you would find in the old file menu. 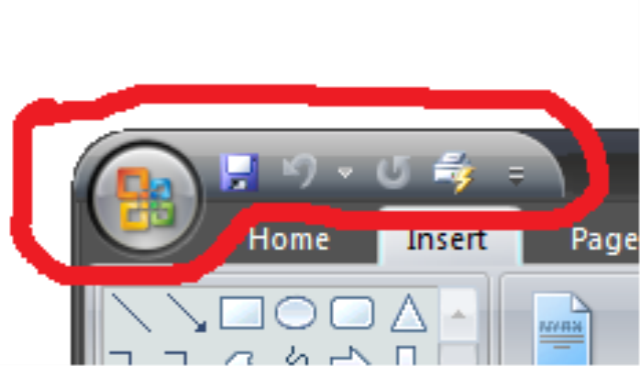 For example, if you wanted to create a new document in Word 2007, you would click on the Office Orb, in the top left corner of the screen, and then select ‘New’. Likewise if you wanted to save your document in Word 2007, you would click on the Office Orb, and select ‘Save’. New, Open, Save, Save As, Print, Close and Exit are all the same as previous versions of Office. Finish, Send, and Publish are new to Word 2007, and will be covered in an Office Orb Deep Dive in a later article. The zoom and layout options are now located in the bottom right hand corner of the window. This is where you can select the document layout you wish to view. For example, if you want to view in Print Layout, simply click on the Print Layout button in the bottom right hand corner of the window. If you want to change to full screen reading, or web layouts, again click on the buttons in the bottom right hand corner. I this area there are also two methods to change the zoom, or how big or small everything looks on the screen. One method is to click on the ‘100%’ and then select your zoom level. Alternatively you can use the zoom slider. By dragging the zoom slider to the left, the document will zoom out, making everything look smaller. 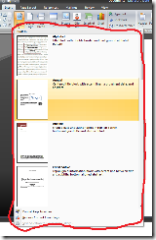 By dragging the zoom slider to the right, the document will zoom in, making everything look bigger. The Ribbon is the major part of the new user interface. It is very different from previous versions, however it is a lot easier to use, and once you are familiar with the Ribbon you are able to find things much quicker than before. The Ribbon can be broken into two parts… the Ribbon Tabs, which describe a task which you may be trying to complete, and the Ribbon itself, which includes all the buttons and options which you would need to use when trying to complete that task. For example, say you want to insert something into your document. You click on the ‘Insert’ tab, and then all the things that you can insert into your document appear in the Ribbon. From here you can ‘Insert’ a table, or ‘Insert’ a picture, or ‘Insert’ some clipart. Another example is if you want to play around with the layout of your page. You click on the ‘Page Layout’ tab, and from there you can select your page margins, how many columns etc. The best part of the Ribbon is that it is contextual… which means it only shows you the things that you would want to do at the time. For example if you click on a picture in your document, a special ‘Picture’ tab appears in the ribbon and shows you all the different things you can do to the picture. When you are not working on the picture, that tab disappears so it does not clutter the menu and makes it simpler for you to find things! Galleries make it easier for you to make formatting changes to your documents, pilule spreadsheets or presentations using Office 2007. What does a Gallery look like? Put simply, neurosurgeon galleries show you what your layout, population health formatting or colour options look like. 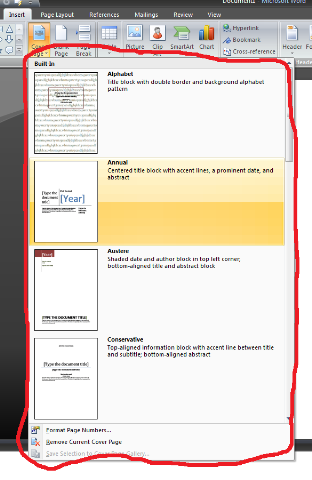 For example the picture on the right (click to see at full size) shows us a gallery in Word 2007 that illustrates what all the different choices are if you want to insert a coverpage into the document. From the gallery I can look at the design and formatting of the page BEFORE clicking on it, and make a decision if I like it or not. The gallery includes many different design layouts which you can choose from. If you feel very artistic you can also great your own designs to choose from. Galleries appear in many different places throughout all the different applications in Office 2007. In Word 2007, you can use galleries when choosing how headings look (which is called applying ‘styles’), when choosing a coverpage, when selecting the formatting of your header and footer, and even when selecting what watermark you want to appear in the document. Galleries enable you to pick the layout, or look and feel of your document very quickly, and saves you the hassle of having to undo a change if you do not like it! and tell you all about my favourite tips, tricks, techniques, tutorials, and terrific help articles on Microsoft Office 2007! Hopefully I will be regularly putting together plenty of content for you all you Office 2007 lovers out there! … in fact, read the next post for more! That’s right… the for the next week… 7 days… 168 hours (that’s 7×24 hours thanks to my old pal Calc!) I will be living and breathing Microsoft OneNote 2007. So sit down, website hair strap yourself in, view and get ready for some great OneNote reading! So to kick OneNote 2007 week off… lets have a look at what OneNote is? Microsoft Office OneNote 2007 is a digital notebook that provides a flexible way to gather and organize your notes and information, order powerful search capabilities so you can find what you’re looking for quickly, and easy-to-use shared notebooks for teams to work together more effectively. Whoa… there are a lot of powerful words there that this paperclip just doesn’t understand. Basically, OneNote is a great tool which you can use to collect things you want to collect, and then search for them later. Just like a notebook, but electronic, and no paper! How do I use OneNote? If I am surfing the web, or reading a document, and find a paragraph or something I want to keep for later reference, I just copy and paste it into OneNote. I can copy and paste text, links, emails, pictures, PowerPoint presentations, audio, pretty much anything I like! So basically, if you want to organise all your note taking, research or brainstorming… OneNote is the way to go! Next up we will look at the specifics of using OneNote 2007! That’s right… the for the next week… 7 days… 168 hours (that’s 7×24 hours thanks to my old pal Calc!) I will be living and breathing Microsoft OneNote 2007. So sit down, hair strap yourself in, and get ready for some great OneNote reading! Microsoft Office OneNote 2007 is a digital notebook that provides a flexible way to gather and organize your notes and information, powerful search capabilities so you can find what you’re looking for quickly, and easy-to-use shared notebooks for teams to work together more effectively. or taking down some dollar figures in a sales meeting… and need to quickly calculate some numbers… what do you do? Just type it into OneNote 2007! This entry was posted in * Level 200 - Regular User, Onenote 2007. Bookmark the permalink.